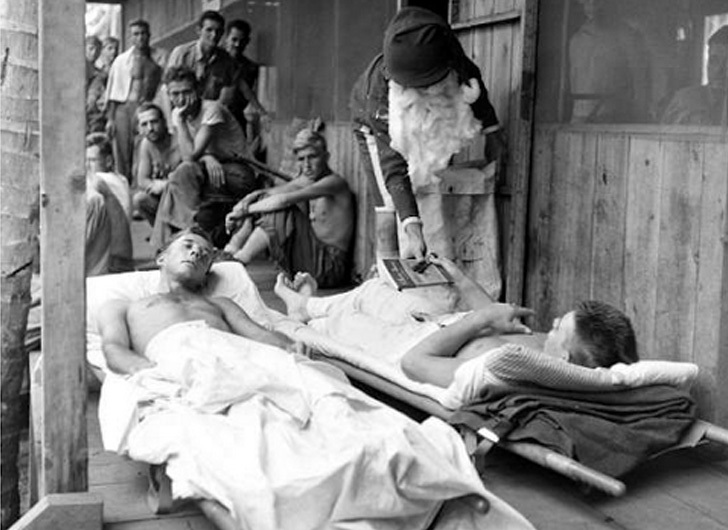 This is Christmas on Guadalcanal. I devote a lot of acreage on this site to the ETO, because imho - and it is very imho indeed - the PTO was distinctly secondary in terms of grand strategy. During the war, pretty much everybody except Admiral King thought that, too, so it's not like I'm taking a controversial position there. The thing is, the grunts knew that that is what everybody thought, too. Which is what made any little vestige of normalcy a bit more colorful, because dying in some forgotten backwater was not at the top of anybody's priority list and a touch of home before it happened was something to be treasured. 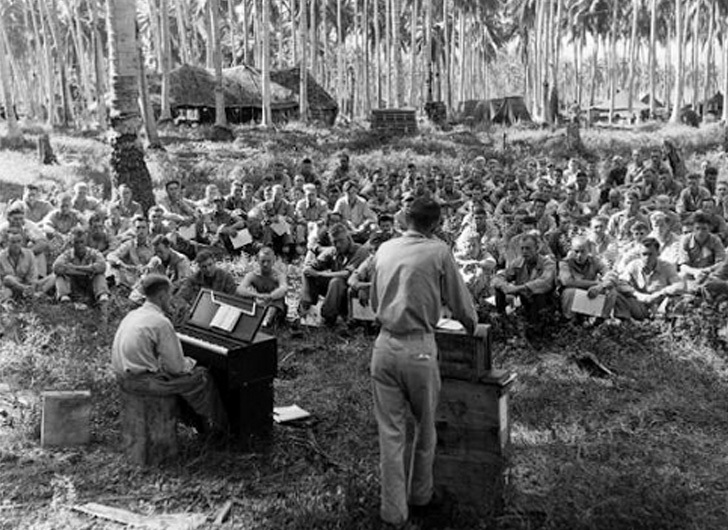 If any of the guys in these photos had ever heard of Guadalcanal before being sent there, it would have been a miracle. There weren't too many miracles in the middle of the Pacific. Another reason is simply that there is more material from the ETO to work with. 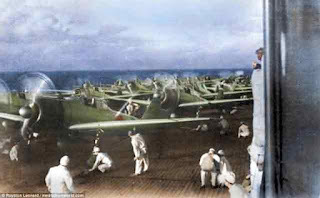 The Pacific campaign involved a lot of long-range carrier battles and short, quick fights for barren isles that nobody cared about then or now. There just isn't as much pizzazz there, regardless of the human consequences. Of course, there were land campaigns, but the scenery was just tree after tree, with occasional beaches full of dead guys. Now, if they had had a lot of beautful color kodachrome to work with, things would look different to posterity. But palm trees in black and white aren't all that snappy. These guys look like they've had enough. Appears to be an inspection. Anyway, regardless, now and then I bestir myself and get back to some dreary tropical island where nothing fun every happened and guys got shot and left to moulder in the surf. Remember that December is the hottest month of the year south of the Equator. 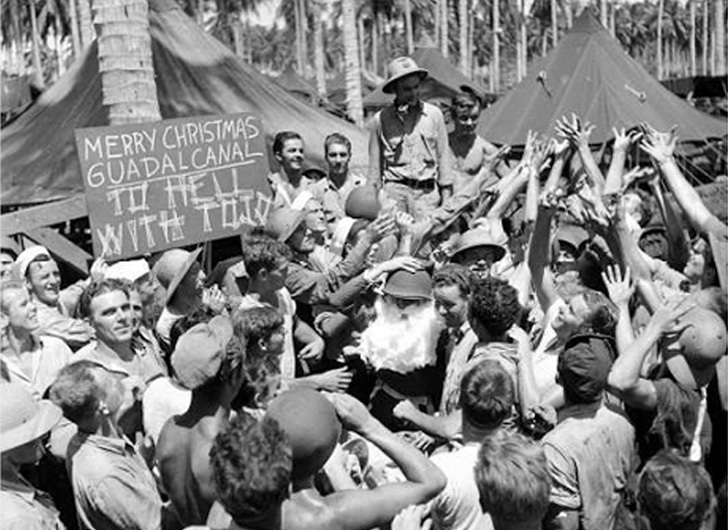 So, in honor of whatever festive spirit may move you, here, ladies and gentlemen, we present: Christmas in Guadalcanal. These were taken in December 1942. 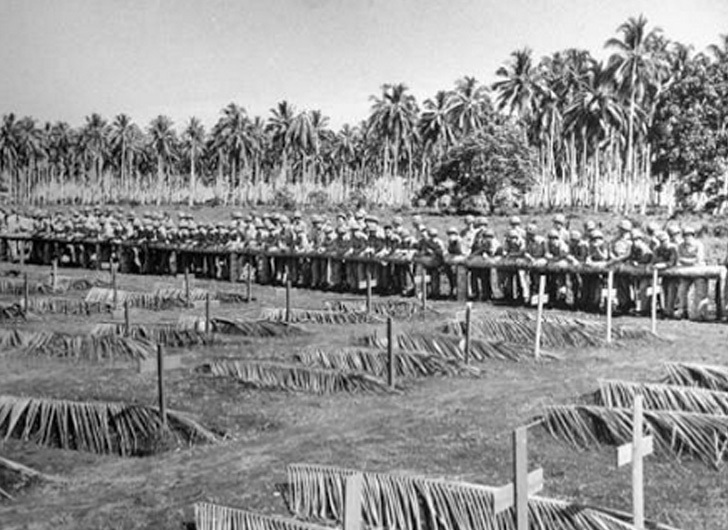 Those with a quick grasp of dates probably realize that the Japanese only had about another month or so on the island before they booked for Rabaul. 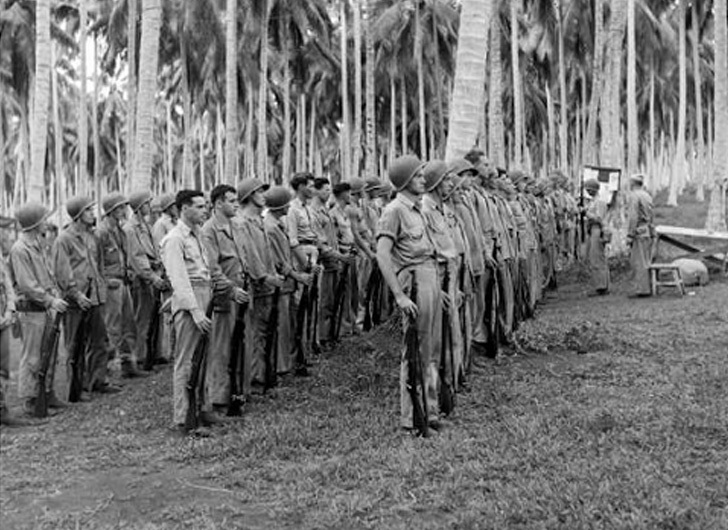 Those who are probably much more knowledgeable than me about this campaign also realize, though, that the battle for Guadalcanal had been by no means won at that point. Yes, the Japanese had been sent reeling, and the US had re-established control of the seas around the island during the previous November. 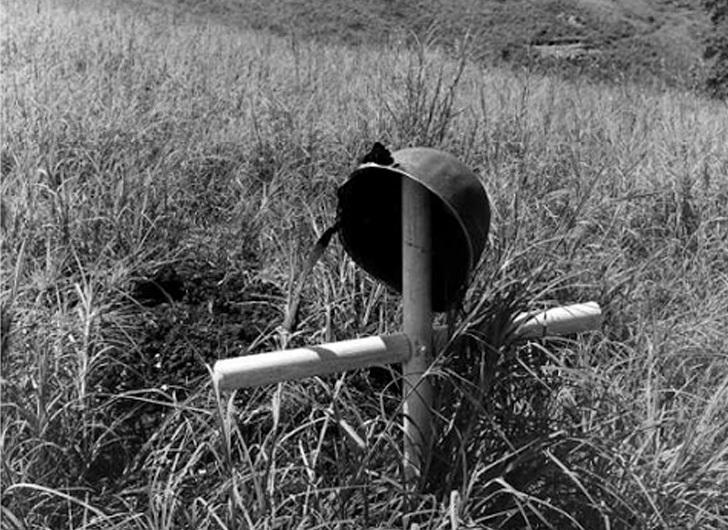 But everything was still uncertain, and the Japanese were launching absolutely insane suicide charges against fixed defenses now and then for some reason known only to them. The Imperial Fleet could at any time have arrived to change the situation, too. That it never did is probably something the top brass in Tokyo deeply regretted in coming years. 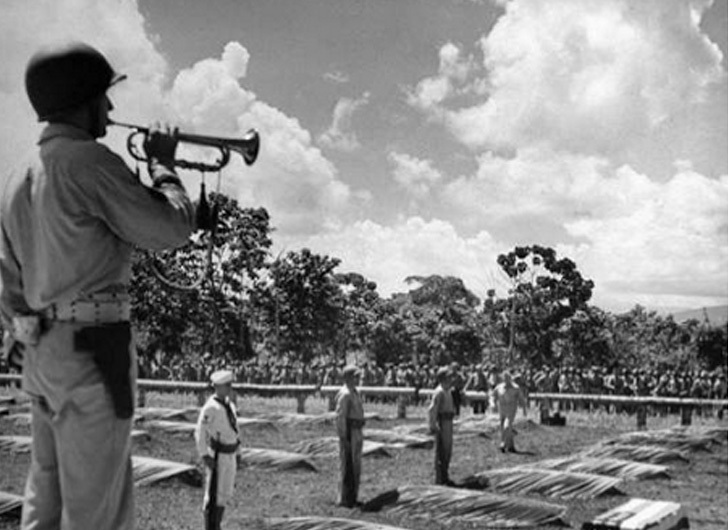 The bottom line is that the war on Guadalcanal was in every sense of the word still hot at this point. If some of these photos seem a tad, shall we say, religious in nature, you are 100% correct, mate. That was the reality then. People prayed before they got shot and left to moulder in the surf. This is a blog about history, not political correctness. I don't always know the original source for photographs, but this time I think I do. Credit goes to Ralph Morse of Time & Life Pictures/Getty Images. 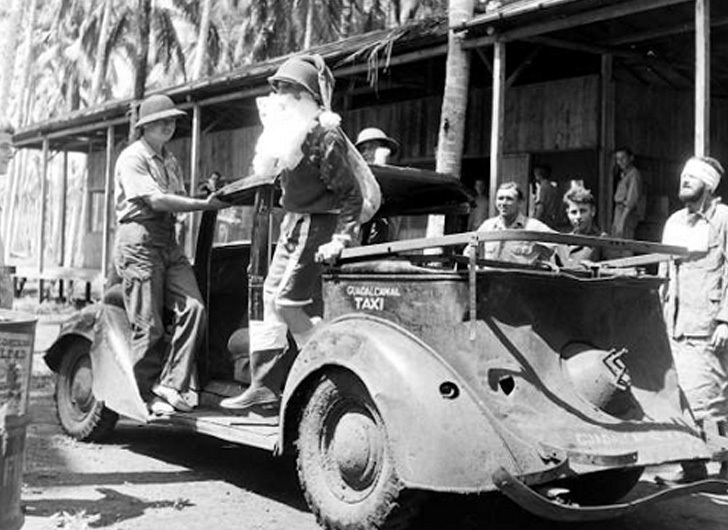 The original title: Santa arrives to entertain Allied troops, Guadalcanal, December 1942. Time to sing a few carols. Incidentally, there is a heavy emphasis on cemeteries in this sequence. 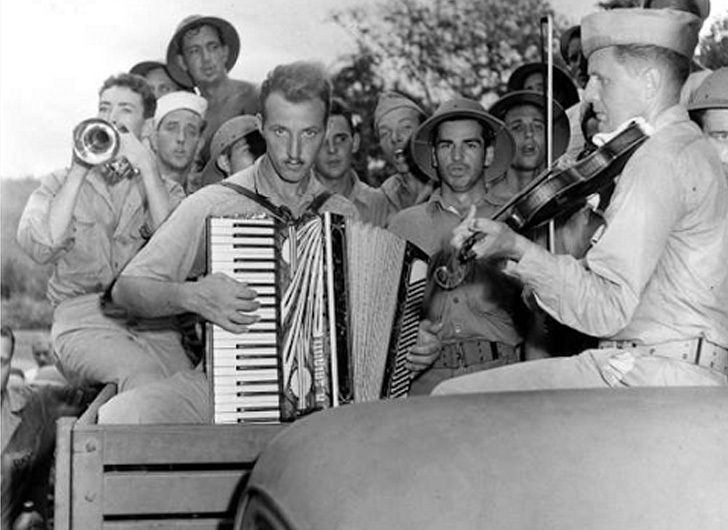 You don't often see that in World War II photo sequences. 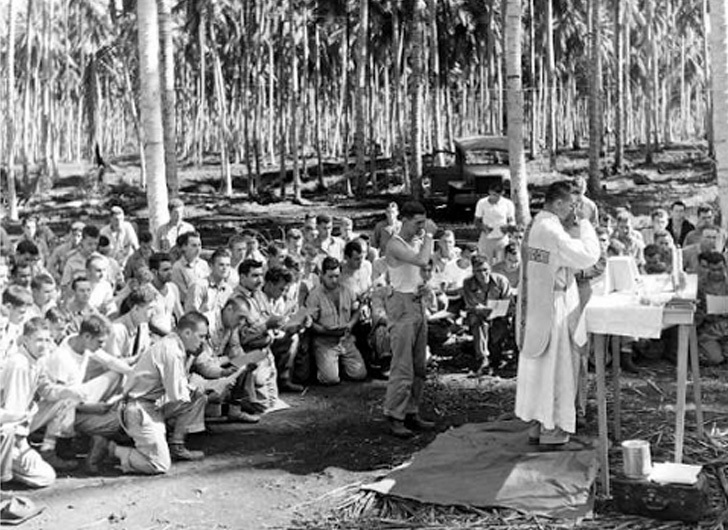 However, here, in Guadalcanal, death from snipers or malaria or whatever strange bug bit you in the morning was a constant reality. While these graves are all well marked, it also is true that, to this day, they can't find some known graves on these islands. They're still looking for them. And that's a fact.